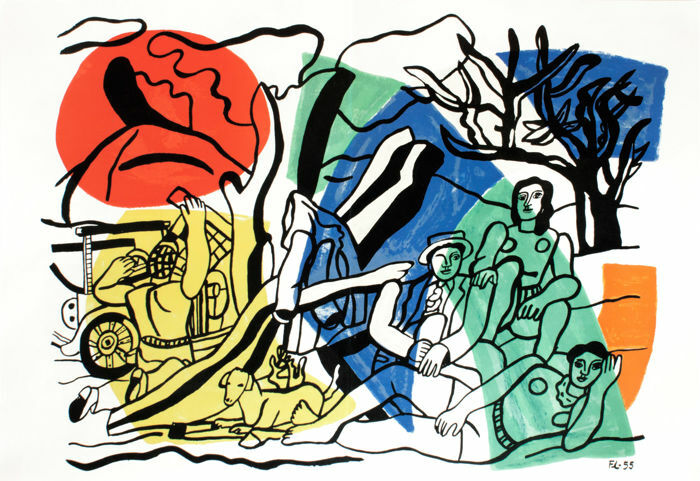 Anya Berger, who translated some of the great socialist thought of the twentieth century into English, had a print of Fernand Léger’s The Outing (1951) at the foot of her care home bed when she died in 2018. It was part of the series of works Léger made inspired by the French Popular Front policy – at a political moment which coincided with Tribune’s foundation across the channel in 1937 – of allowing two weeks’ paid holiday across all industries and workers. It was a new kind of mass leisure. However short-lived that moment of joy and optimism, its repercussions lasted. It was in the trenches that I really seized the quality of objects. I thought back on my first abstract studies, and a quite different idea concerning the means, the use and application of abstract art took root in my mind. On leave in Paris, Léger met Trotsky (they talked about the idea of polychroming Moscow) and around 1915 or ’16, he saw his first Chaplin film with Guillaume Apollinaire. After the war, he collaborated on Mechanical Ballet (1923-4), starting and opening with images of a cubist Charlie Chaplin, scored by George Antheil, and proceeding with a kaleidoscoped, zoomed-in-and-out, inverted choreography of everyday objects. Later, he wrote to Sergei Eisenstein ‘you are fortunate in belonging to a profession which is socially oriented to the masses. We [painters] are isolated by the fact that our public is an exclusive one.’ The discovery of film came too late for him to retrain entirely, but his painting is a response to a photographed world. 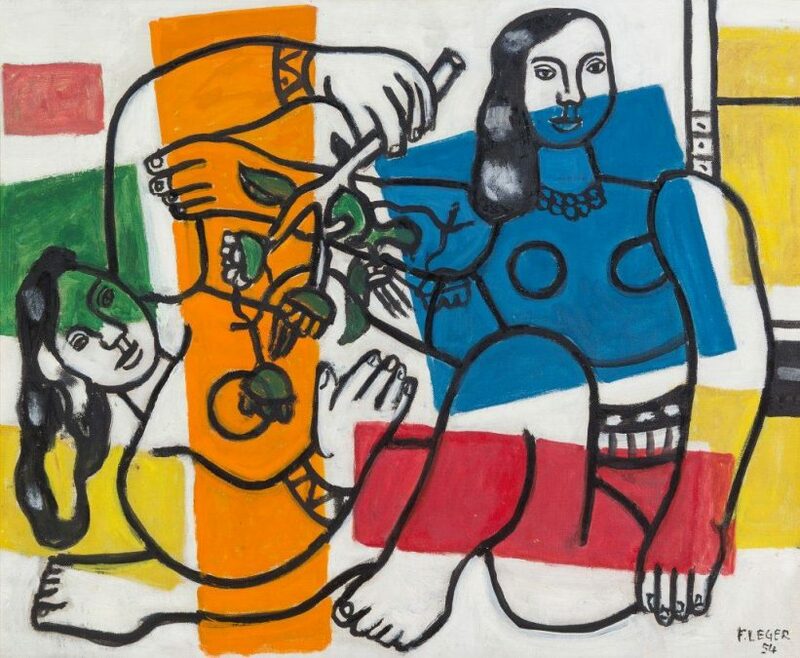 Fernand Léger’s 1954 work Two Women Holding Flowers. The hands of men and women have made all that I carry with me. All races, all climates, all beliefs have collaborated. The oldest traditions and the most modern techniques. It’s a shame, then, that these works have to share a room with a ugly wall of vinyl transfers explaining ‘Fernand Léger’s Circles of Modernism’ which would’ve been better in a proper exhibition catalogue. But it’s an intelligent piece of curating which has the audio from the adjacent show bleed into the last room the way George Antheil bled into the first. Tate Liverpool have juxtaposed this Léger retrospective with an exhibition of films and installations by the Korean artists Moon Kyungwon and Jeon Joonho; these take their title from William Morris’s fiction of a socialist utopia, News from Nowhere (1890). This contextualises Léger’s pattern designs in the last room: the idea of making art literally the fabric of everyday life is Morris-like, if the precise aesthetic was not. But Moon and Jeon’s vision of the future is dystopian. After an apparently man-made apocalypse, what remains of human society in the late twenty-first century is controlled by a small number of rival corporations. A woman works in a sterile-looking lab, reconstructing elements from a pre-apocalyptic sculptor’s studio. It’s probably uncharitable to ask if Moon and Jeon’s work stands up to a juxtaposition with Léger but, taken together, the exhibitions make an argument. Worse than Chaplin’s complaint that ‘machinery that gives abundance has left us in want’, it has taken us to the brink of extinction through climate change. If that machinery is still ours to control, we might have a choice between one future and the other.